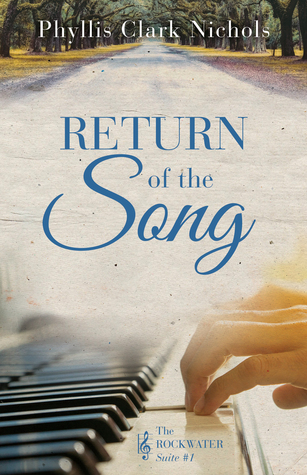 Welcome to the Blog Tour & Giveaway for Return of the Song by Phyllis Clark Nichols, hosted by JustRead Publicity Tours! Caroline Carlyle's dreams were crushed when her fiancé died six weeks before their wedding. For years she wrestled with aching loss and shattered faith, struggling to find the inspiration that once came so easily. Abandoning her half-finished piano compositions, Caroline trades her old ambitions for the comfort and familiarity of life as the town’s piano teacher. But Caroline's world turns upside down when a mysterious stranger enters her life. Filled with courage and fresh purpose, Caroline embarks on a quest to track down the beloved, rare piano she played as a child. Her search leads her to Rockwater, the Kentucky estate of a wealthy gentleman, where Caroline finds her heart may be composing a surprising new song. She had been walking a straight, dull path the last six years, living on level ground in a valley of monotony void of mountain peaks. She had found comfort in the simmering state of her daily days; but from somewhere deep inside herself, a place she could not describe or explain, came the unsettling sense her path was about to take a turn. Return of the Song by the gifted Phyllis Clark Nichols is the type of story I love most and I enjoyed every minute spent within its pages. There’s a gentle thread of romance, but this is primarily in the women’s fiction genre – the character-driven story of a woman gradually finding newness and hope after a heartbreaking loss six years previously. The prose is simply exquisite, the pace steady, and characterization is rich. The story resonated with me on many levels, for like Caroline, I’m a musician who has taught piano, and I live in Georgia. From the small-town Moss Point setting, to Caroline’s performance of the classics, composing, and instilling a love for music in her students, Nichols crafted a story that sparkles. The prologue gives us the last few hours of David’s life in Guatemala and I’m so glad this was included, because it shows his heart for the Lord and his fiancé, allowing his spirit to live through the book. There’s a wealth of strong supporting characters – such as Sam and Angel, an older couple who love Caroline like a daughter, and the young savant Bella. And oh, how I loved Roderick! Because they converse by phone and don’t actually meet in person until way in the book, it might seem at first that romance isn’t a key element. However, I think this reflects the author’s pure genius because I connected with Roderick from the beginning and felt the realness of their steadily growing friendship. Can’t wait to see what happens with these two! Although very much open ended, Return of the Song concluded satisfactorily for me and I understand that Freedom of the Song, to be released next spring, will pick up right where this one leaves off. Highly recommended, “best of the best” for me! I received a copy of this book through JustRead Tours. The opinions expressed in this review are entirely my own. 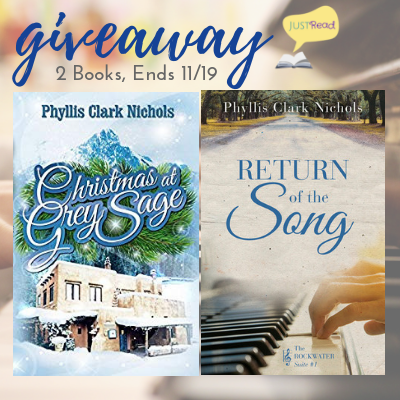 Please click on the title to see my review of the previous excellent book by Phyllis Clark Nichols, Christmas at Grey Sage. Enter via the Rafflecopter giveaway below. Giveaway will begin at midnight November 12, 2018 and last through 11:59pm November 19, 2018. US only. Winners will be notified within a week of close of the giveaway and given 48 hours to respond or a new winner will be chosen. Giveaway is subject to the policies found here. This glowing review convinced me that I need to read this book!